Required in any style, including Ballet, Jazz, Contemporary, Modern, Hip Hop, Break, Cheer, Dance Team or Martial Arts. Must be able to learn and perform choreography quickly. Cast members will receive a small fee and FGA gift!! Wear clothing you can move in. Auditions start promptly at 3pm. Girls under 18 must have a parent/guardian sign a release form. Great chance to show your talent!! Should girls prepare their own routine or are they going to have the choreographer teach them a routine? My daughter is excited about this one. Ditto Samantha’s question! My daughter is also excited, but we sure would like more info about the casting call and what the video is going to be. No need to prepare a dance for this audition. You will be given some steps to learn. The video will be a how-to that will go up on you tube on the fairy godmother academy channel and on our website. 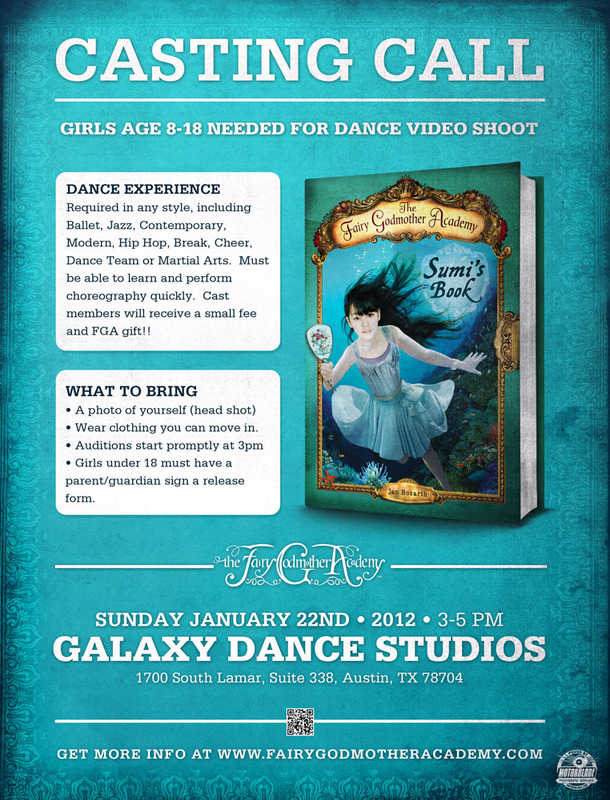 We will be hosting a dance contest based on the Kalis moves described in Book 2- Kerka’s book and shown in the video. Kalis is a martial art/dance form used in Aventurine and taught by the fairies. It’s going to be fun!!! Shane and I wrote a new piece of music for this. It’s called “To Be Real”. Would there be room for exceptions for a mature 7 yr old? Hi! I received an email from Christine with the Austin area home schoolers, and her message said that there was an audition on Jan. 29. Is that correct? I’m hoping it is! Thanks! I have seen conflicting dates for this audition. I have seen both the 22 and the 29. Which is the correct day? ARE THERE ANY CASTINGS IN MINNESOTA OR WISCONSIN????????????????? I am planning a trip to Minnesota this summer. Look for those dates on this site soon. But in the meantime, you can learn all the steps to the dance on fgadance.com or fairygodmotheracademydance.com. These will be up in about two weeks so keep checking. You can learn these with friends and upload your own video to our site. any news on the video! We are really excited to see it!!!!!!!!!! I would love to be dancing again.